On arrival you will be transferred to the Himawari Hotel for two nights. 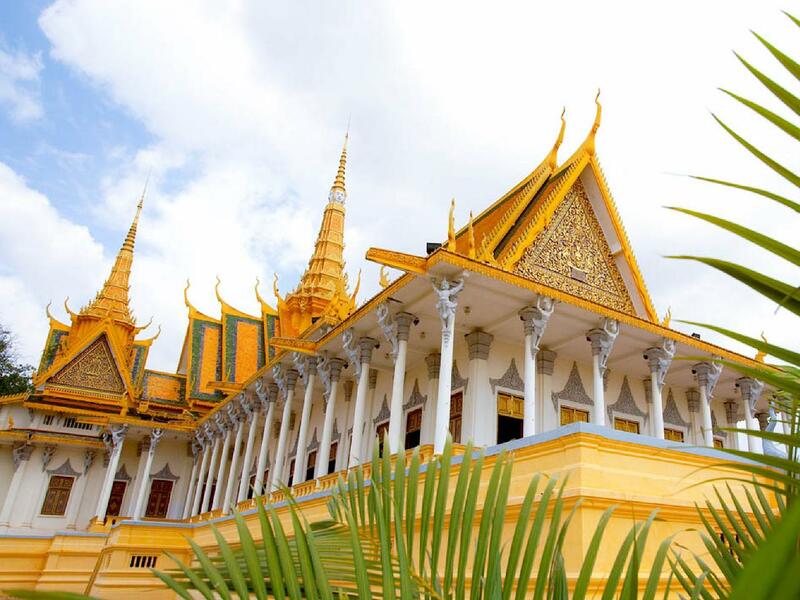 Explore the city by cyclo visiting Wat Phnom, the Royal Palace, the Silver Pagoda and the National Museum. Visit the Tuol Sleng Genocide Museum and the Killing Fields and learn about Cambodia’s past under the leadership of Pol Pot’s Khmer Rouge. Stop at the Central Market and try your hand at bargaining for souvenirs, jewellery and fabrics. Enjoy Khmer welcome dinner at the charity Romdeng Restaurant (except in April). Fly to Siem Reap and stay three nights at the Lotus Blanc Resort & Spa. Sien Peap as the official gateway to Angkor Wat. Today take a tuk tuk ride to Angkor Thom, the last capital of the Khmers and home of the Elephant Terrace. Continue to the Terrace of the Leper King, the Terrace of Elephants and Bayon Temple. Witness the sun setting from Pre Rup, a pyramidal temple surrounded by rice fields and tonight enjoy a traditional Khmer welcome dinner. Visit the temples of Preah Khan, Banteay Samre and Banteay Srey, better known as the ‘Citadel of the Women’. Continue to Banteay Kdej and Ta Prohm, known as the ‘Kingdom of Trees’ because of the giant fig and banyan trees that are slowly reclaiming the temple. Late this afternoon take a traditional tuk tuk to the McDermott Gallery and enjoy a welcome drink as you stroll through the gallery. Dinner tonight will be at the Foreign Correspondents Club. Enjoy a boat trip on the Tonle Sap Lake and witness the unique lifestyle of the people who inhabit the lake region. Visit Kampong Kleang, a village where houses are built on stilts and see the fishing communities that thrive along the edges of the lake. Fly to Saigon and stay two nights at the Grand Hotel. Travel to Cu Chi Tunnels which were constructed by Viet Cong fighters during the Vietnam War. Continue to the Reunification Palace, History Museum or Revolutionary Museum, the Notre Dame Cathedral, the Central Post Office, Dong Khoi Street and the Ben Thanh Market. This evening enjoy a relaxing dinner cruise. Spend a day exploring the colourful floating markets and lush back waterways of the Mekong Delta. 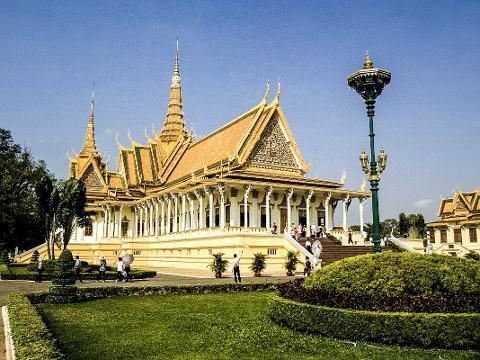 Journey to Cai Be and Vinh Long and cruise through the many tributaries of the Mekong. Walk to the villages and wander amongst vibrant tropical fruit gardens. Continue to Can Tho and stay one night at the Victoria Can Tho Hotel. An early morning visit to the bustling floating markets of Cai Rang. Sail through the markets and watch the locals haggle and trade their wares to interested buyers. Explore the rural city of Can Tho, passing the local market and Khmer Pagoda. Return to Saigon and stay two nights. Fly to Danang where you will be transferred via Marble Mountain to Hoi An for two nights at the Hoi An Historic Hotel. En route stop at Non Nuoc Beach and the Cham Museum. Hoi An is brimming with unique charm and tranquility. Enjoy a cyclo tour and see architecture reminiscent of the traders of a bygone era. Visit the unique Japanese covered bridge and a Chinese communal house. Enjoy a boat ride on the Thu Bon River and visit Thanh Ha to see skilled locals at work producing beautiful pottery. Transfer to Danang airport for your flight to Hanoi and stay one night at The Ann Hotel. Enjoy lunch at KOTO Restaurant. Afternoon visit to the Temple of Literature and the Museum of History. This evening enjoy the Water Puppet show. Watch the sun rise over the bay before your return to the pier and transfer back to Hanoi for two nights. Today visit Ho Chi Minh’s Mausoleum, his wooden cottage and the One Pillar Pagoda. 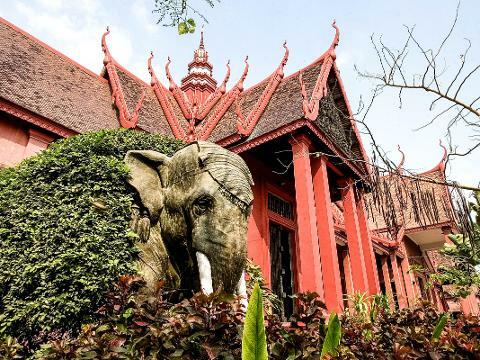 Continue to Hao Lo Prison, formerly known as the ‘Hanoi Hilton’, Quan Thanh Temple and the Museum of Ethnology. This evening enjoy dinner at the Ly Club. Farewell Cambodia and Vietnam as you transfer to the airport for your onward flight.